In our 81st episode, we brought in a Leviathan as a guest host to substitute for our still allergy-suffering co-joey Jen. After a very brief force-filled introduction we get down to business and talk about what we’ve been up to: Leviathan has been doing work with a Demon Hunter, Breja is still chasing his unicorn… a RoRG, and Nevik has been moonlighting as a Crusader. * We were joined by Leviathan of BlizzPro’s Westmarch Workshop to help with the heavy-lifting of hosting the show. Following our typical catching up at the top of the show, Nevik virtually sits down with Leviathan to get to know more about the robot behind the robot? * As mentioned in episode 80 we had to push a few of the emails (and an audio) we received from our wonderful listeners due to time constraints (and Nevik technical failings). Then we received even more, and as you might have guessed, we had to push those emails to episode 82. Listener participation has been absolutely amazing and is primarily why we do this show, so keep them coming! We WILL get to all the emails we receive, even if occasionally we have to push a few to the next episode. Send in your stories of RNGesus triumph to Show@ShatteredSoulstone.com! * We received a bunch of tweets (as you might) from @playrider2, @Kherova, @Skullbash1241, @EYedgar0111, @CruentusRelic, @pergosmaster, @josukeshair, @N3rdwards, @KeeperofAlts, @Kagerai_Leblue, @eG_acefisher1, @CkRtech, @scanline75, and our very own @Lanntonio and @QueenofHaiku. Thank you for your tweets. Don’t forget that you, too, can send in your thoughts via social media outlets such as Facebook, Google+, and Twitter. * We posed the question on Twitter asking how your seasonal progression has been going. Achieved a new personal best? We wanted to know. Be sure to follow the show on Twitter to participate in future Questions of the Show. * One issue that seems to be growing in volume is the disparity of solo play versus playing with a group. We discuss, at length, our own opinions and thoughts on this issue and its affect on season play and the community in general. And then if that wasn’t enough, we received a 10 minute audio from our good friend @Kagerai_Leblue sharing his musings on how the issue affects him. * Seemingly out-of-the-blue the 7th Play Your Way Thursday happened and a few nuggets of what we can expect coming in the future were dropped in our laps. In case you missed the live broadcast of the stream, the Video On Demand has been made available. * Are you planning on attending Blizzcon 2015? Even if you aren’t, you can still participate and enter 3 of the 4 contests that we are familiar with. Be sure to read up on all of the details and deadlines should you feel saucy enough to enter. * After two straight shows our beloved segment, Official Forum Thread Masterpiece Theater, appearing we were not able to record one in time to be included in this episode. WE NEED YOUR HELP! Your participation can ensure that this fun segment makes an appearance every show. 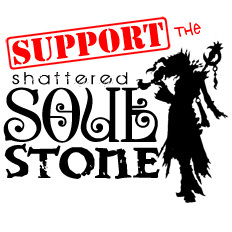 Send your Official Forum Thread Masterpiece Theater audio segments (or humorous forum threads) to Show@ShatteredSoulstone.com. * Wesley, what about the ROUSes? * That’s it. We can all stop playing Diablo III proper and just spend all of our time gambling for virtual ancient weapons with the amazing Kadala Gambling Simulator. * You may have noticed a fairly large undercurrent of Final Fantasy love in this episode, this is largely thanks to a very special Crusader transmog featured over at BlizzPro. A CRUSADER COSPLAYING AS A DRAGOON? YESSSH. * Prompted by listener, @josukeshair, we dug up all that we could about the old podcast, the Worldstone Keep. While the show has long gone cold, you can still take a trip down memory-lane and watch/listen to their old shows on YouTube. Mayhaps one day this show will resurface? Keep an eye out on their Facebook group. * Boom! Dragons! AND DRAGOONS! Final Fantasy XIV: Heavensward is right around the corner. * Avengers: Age of Ultron was absolutely amazing. Go see it. JUST DO IT. * After a false-start Nevik finally started understanding, and enjoying, Shadow of Mordor. While this game flies in the faces of Tolkien purists, it’s an amazing game and you can probably pick it up on the cheap!